Love these! Have had them for a few years and they still look perfect. Easy to clean, as well. During a move, some other items must have hit the canvas and left some marks. A magic eraser wiped all of it away! 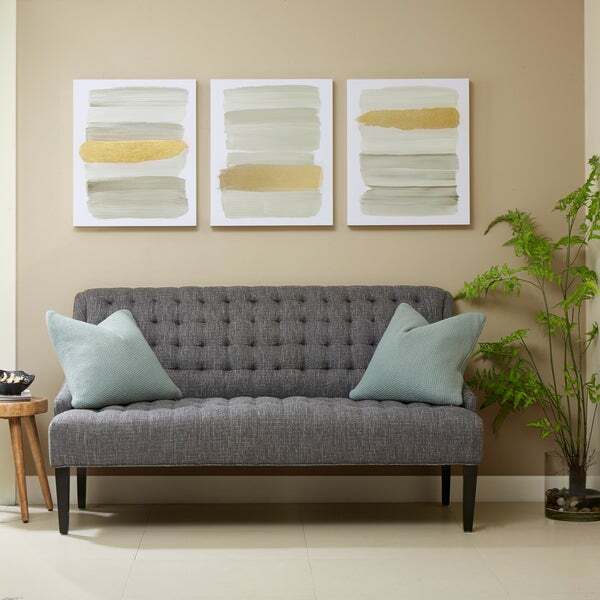 Enhance your home's artistic aesthetic with this three-piece artwork by Edith Phelps. Featuring stripes in shades of grey and metallic gold, this abstract artwork brings an eye-catching modern flair to any room in your home. These pieces come ready to hang and do not require a frame. I am overall satisfied with this 3 Piece Set. I think the price is very fair and the quality is quite good. My favorite thing about these pieces is that the gold is in fact metallic gold, which is difficult to find. The stock photo does make the other paint strokes appear to be very light shades of gray and tan, however the colors are much darker in person. The paint strokes have what looks to be hot glue gun glue over top of them to give them the illusion of being actually painted on the canvas, which kind of looks cool from a distance. The pieces came together in one box and were well packaged. They feature two hooks on the back of each side, however I hung them with one thumb tac in order to do less damage to my wall. 2 of the pieces did come with some dirt marks on them, I haven't tried to clean them off yet but it is nothing too noticeable. The corner cardboard protectors did leave white marks on the side edges of the canvas however this can only be seen from the sides and it is not too noticeable. Overall I think these are great for the price and they look so great in the hallway of my Miami condo! I was a little skeptical when purchasing this three-piece set. However now that I have it on the wall I can't stop looking at it. It is the perfect piece to have above the sofa. Purchased this set at a great price. Needed a simple abstract painting for a wall between window and corner. The colors are different shades of gray with one heavy stroke of gold. It is definitely gold, however depending on the light it can change color a bit from bright gold to a brassy color. Gives the picture dimension. The item came very well packaged. It arrived very quickly. Easy to hang. I spaced them vertically with only 2 inches between them. I would purchase them again. Very satisfied. Good quality. Described accurately. Great price for the set. looks very high quality-- easy to hang. The color and size of these canvas prints was as expected. I ordered them because I wanted to repeat the gold tones in the room. The gold is a metalic and exactly like the online photos (some other reviewers have stated that it is more bronze.) I am only giving 3 stars because there is a clear rubbery substance added to the surface to simulate brush strokes. This would have been fine except there are large globs that show and I'm debating returning them for this reason. This is a very cute canvas set. The colors are very vibrant and the gold looks great. They would add a nice pop of color to any room. And they are a great price for a set of 3. MODERN GLAM I needed something new for over my new couch that helped to tie in the new glass + gold tables I bought. 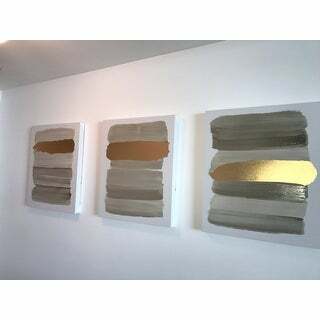 These three abstract gold canvases worked pefectly. They are an inexpensive solution with a lot of design impact! I have them hanging in my bedroom, mix of metallic bronze and mettallic gold, these are really perfect. The colors of these pictures go great in my new and improved dining room. The gold metallic is especially vibrant as it matches the decoritive bowl and brown/gold clock on the wall. These are pretty space fillers for the price! I hung them over a bed as a collection. They’re somewhat metallic, nice dimension, easy to hang. I’d recommend them for the price. Hung these in our 2nd guest bedroom. Nicely matches our preexisting decor. Easy to hang with 3M strips rather than messing with hooks and nails. Love them. They are simple and added the perfect amount of texture to the room. "What are the dimensions of each piece?" The gold and grey are a nice combination for my room, and the contrast against the white background will make them stand out.